Oz Hotels allows holiday makers looking for cheap accommodation in Blue Mountains to compare a range of independently owned and non-related hotels, resorts and apartments at the same time. The accommodation on Oz Hotels ranges from luxury resorts and honeymoon suites right through to budget hotel rooms and family friendly apartments. With discount rates for longer stays you can comfortably book your next Blue Mountains accommodation on Oz Hotels and take advantage of the great savings available. The Blue Mountains is a place of great natural beauty and rich cultural resources. It attracts millions of visitors from throughout the world each year, making it one of the top three tourist destinations in Australia. Visitors to the Blue Mountains can discover a tempting combination of breathtaking nature, romantic accommodation, rejuvenating day spa treatments, fine restaurants and indulgent shopping just 2 hours from Sydney. Relax and breathe the fresh mountain air as you marvel at a majestic landscape of waterfalls and awe-inspiring sandstone escarpments. The Blue Mountains region also has one of the most extensive cave networks in Australia including the Jenolan Caves, Abercrombie Caves and the remote Wombeyan Caves. The Blue Mountains is a nature lover's paradise with an abundance of colourful bird, animal and plant life as well as landscapes ranging from rainforest to heathland. Leura is widely regarded as the most charming township in the entire Blue Mountains region and the brand new Oaks Spires provides the ideal luxury serviced apartment accommodation for holiday retreats or romantic getaways from the mayhem of the big city. Situated at the top of the Leura Mall the Oaks Spires Apartments are fully self contained and are ideally set amoungst 3 acres of landscaped grounds. The Oaks Spires Leura is the ideal Blue Mountains accommodation from which to explore the entire Blue Mountains region including the Three Sisters and Scenic Railway, fabulous golf courses and the shops, galleries, cafes and restaurants which are just a short walk away. Hotel Blue Katoomba is a breath of fresh air, tranquil & unique, a hotel retreat in world heritage listed natural landscapes - The Blue Mountains. Step into the wonders of yesteryear at Hotel Blue Katoomba and experience the true magnificence of the Blue Mountains. Hotel Blue's distinctive & charming character makes for an idealic getaway that will elevate and calm you. Treat yourself to the memories that will stay with you for a lifetime. Featuring a prime location only minutes walk from the Katoomba scenic attractions and world famous Three Sisters, Hotel Blue offers a stylish mountain setting, celebrating the architecture that has distinguished this serene community since the 1920s and 30s. Hotel Blue's guest rooms are the perfect base to explore and reconnect with yourself and your loved ones. The guest rooms, each with private ensuite bathroom and shower, television, bar fridge and tea/coffee-making facilities are classically designed, with a hint of the Hotel's original character. Whether you're looking for a romantic setting for a wedding, a relaxing escape from the hustle and bustle or simply a base to explore the magic of the Blue Mountains, Hotel Blue's guest rooms are sure to warm and welcome a variety of individuals. An aura of elegance sets the tone for the Hotel's formal dining room - the Sisters Blue restaurant - beautifully presented and overlooking the Katoomba historic Lurline Street. The Parlour Bar is an intimate bar featuring high ceilings, antique decor and a characteristic 'hand-carved bar' bringing to life an atmosphere reminiscent of the Victorian era. Cafe 88 is a new and vibrant street-side licensed cafe offering light lunches, a selection of deli style sandwiches, hot soups and tantalizing cakes. Further facilities include FREE on-site security car parking and indoor heated swimming pool and spa - ideal for relaxing after a day exploring the stunning Blue Mountains. Corporate guests are well catered for with high speed wireless internet access, faxing facilities and a conference centre. Conveniently located, Hotel Blue is set amongst the Katoomba scenic Echo Point and Three Sisters, poignant antique shops, interesting art galleries, scrumptious restaurants and thriving live music scene. The friendly staff strive to ensure that not only your stay at Hotel Blue Katoomba is extraordinary, but your experience of the Blue Mountains is too, providing bookings for outdoor trips such as guided scenic tours, bush walking, and adventure activities such as canyoning and rock climbing. At Hotel Blue the aim is to provide all guests with an outstanding and memorable experience. The Palais Royale Boutique Hotel is situated in a delightful 100 year old heritage guesthouse - an ideal romantic 4 star luxury boutique escape. Professional staff will assist in providing your every need, understanding that it is the small things that are so important. Come and see the best kept secret in the Blue Mountains. Guests are welcomed into the luxurious Royale Lounge on arrival With 3 separate lounge areas, each with it's own theme and atmosphere, guests are encouraged to relax. Original leadlight windows feature along with a fireplace and artworks. The Palais Royale is a 40 room guesthouse situated in the heart of Katoomba. All guest accommodation rooms are non smoking, featuring heritage style decor, air conditioning, private ensuite bathroom with walk in shower, toilet, hairdryer and bath, colour TV, wireless internet access, alarm clock, direct dialling phone, writing desk and chair, bar fridge, mini bar, tea and coffee making facilities, wake up calls, iron and ironing board, Private balconies are available upon request. Room service is also available. Guests have 24 hour access to a heated spa and sauna along with separate male and female change rooms. Also located on the lower ground floor is the massage room where guests can book in for a range of therapeutic and relaxing treatments. Further facilities include conference centre and function rooms, FREE off street parking, restaurant and bar, delightful courtyard garden, tour desk, daily housekeeping, disabled wheelchair accessible rooms, faxing facilities and guest laundry. A hearty Mountains Breakfast is served in our heritage style dining room. For dinner, take advantage of the many cafes and restaurants within walking distance of the guesthouse. The Best Western Alpine Motor Inn is a 3 star motel offering Queen, Twin & Family Hotel Rooms located in Katoomba in the heart of the stunning Blue Mountains. 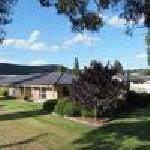 Next time you visit Blue Mountains, stay at Best Western Alpine Motor Inn. Look no further, as Katoomba has it all! Nestled in the centre of the Blue Mountains National Park and under 2 hours from Sydney, Katoomba offers easy access to activties including caving, climbing and bushwalking. From bushwalks in Summer to the famous Yulefest Christmas celebration in Winter, you're bound to have a brilliant stay whenever you choose to visit Katoomba. Make the most of your Blue Mountains holiday by visiting the nearby Echo Point and Three Sisters to experience first hand the blue eucalyptus haze that gives the mountains their name. Stay at the eco-friendly Best Western Alpine Motor Inn, Katoomba located in a premier position in the Blue Mountains and close to Katoomba and Leura shops, hospital and train station. The motel is the ideal base to explore the Blue Mountains World Heritage National Park, the magnificent "Three Sisters", Echo Point, also "Scenic World" and "Cable Car", Jenolan Caves, the Jamison Valley and the superb lookouts and panoramic views from the Cliff top Walks. Explore the escarpments and endless blue vistas of the exhilarating "Blue Mountains National Park". Enjoy hiking, golf, many fine local restaurants and cafes as well as tourist scenic drives throughout the region. The Best Western Alpine Motor Inn, Blue Mountains is the only officially rated four-star motel in Katoomba. The hotel is small enough to provide personalized attention whilst retaining the professionalism and efficiency of a top-class establishment. Perfect for singles, couples, friends on holiday or families, the Best Western Alpine Motor Inn, Blue Mountains offers Queen, Twin and Family Hotel Rooms. All guest accommodation rooms are spacious, comfortable and non smoking, featuring an open plan design with double glazing for extra comfort and privacy, reverse cycle air conditioning and heating, comfortable bedding with electric blankets, a modern private ensuite bathroom with shower, toilet, hairdryer and bathroom amenities, LCD Flat screen TV, FREE Austar cable TV, direct dialling STD/ISD phone with voicemail, FREE WI FI INTERNET, writing desk with lamp and chair, modem access, tea and coffee making facilities, fridge - bar size, toaster, mini bar, alarm clock, ironing equipment and a view from every room. The Best Western Alpine Motor Inn, Katoomba offers an excellent range of guest facilities and services to make your stay a comfortable one. The licensed restaurant and bar give you the opportunity to relax and unwind at the end of the day. Restaurant room service is also available for evening meals. The playground is ideal for the children to enjoy. Further facilites include an arrival / departure lounge, airport shuttle, dry cleaning / laundry service, ice machine, interconnecting rooms, luggage storage, FREE onsite car parking, daily housekeeping, tour desk, cot hire, guest laundry and wheelchair accessibility. The friendly staff and management will be happy to help you to enjoy your stay in Best Western Alpine Motor Inn while visiting World Heritage Blue Mountains region. Business facilities include FREE WI FI INTERNET in all guest accommodation rooms, a business centre with fax, photocopying, computer & internet services. For personal and professional customer service and an idyllic location in the Blue Mountains, make a reservation at this Katoomba motel today! The Zig Zag Motel provides travellers with a choice of hotel accommodation just 1 kilometre from the Lithgow CBD in the heart of the Blue Mountains. Recently refurbished and set in delightful landscaped gardens, the Zig Zag Motel is central to all the attractions the region has to offer, including World Heritage listed National Parks, Jenolan Caves, the renowned Three Sisters at Echo Point, the Zig Zag Railway and the many other scenic attractions of the Blue Mountains. The Zig Zag Motel, Blue Mountains offers accommodation hotel rooms in a variety of configurations including Double, Double + Single Hotel Rooms and Deluxe Rooms to suit any budget. All rooms are non smoking and located on the ground floor, with easy and ample parking just outside the door. All are equipped with individual air conditioning and heating, comfortable beds with electric blankets and all of the facilities to make you feel right at home. The Zig Zag Motel, Blue Mountains offers a range of guest facilities and services including a fully licensed restaurant, solar heated swimming pool, room service, guest laundry, bar, luggage storage, tour desk, interconnecting rooms, disabled facilities, daily housekeeping and free car parking. Bygone Beautys Cottages offers 3 star 1 and 3 bedroom self contained cottages accommodation in the magical Blue Mountains. Bygone Beautys Cottages are nestled in the stunning Blue Mountains, a World Heritage Listed Area, only one and a half hours west of Sydney. Perfect for a romantic weekend in the Blue Mountains, a family holiday or for any group looking for a great holiday. Local to Bygone Beautys Cottages, several minutes drive away are amazing bushwalks from Wentworth Falls. Enjoy a picnic at Wentworth Falls Lake. The extremely popular Leura Village is the next village west from Wentworth Falls. Leura offers, Bygone Beautys tearooms - home of the World's largest private collection of teapots, antiques, jewellery, collectables and gifts. Other Leura experiences include cafes, restaurants, galleries, Josophan's chocolates and many specialty shops. Nearby Katoomba offers Echo Point and the World famous Three Sisters, Scenic world with three major rides (Skyway, Railway & Cableway) in addition to the rainforest boardwalk. The Edge giant screen cinema, cafes and restaurants, the Paragon chocolate shop, sightseeing busesincredible adventure experience. On arrival at the Bygone Beautys Cottages, burning log fires are set, beds are already made up complete with electric blankets. The cottages have a basket of fresh fruit, flowers and chocolates awaiting your arrival. The kitchen is stocked with a traditional country style breakfast platter. The bathrooms have an ample supply of fluffy towels and bath toiletries. During your stay in the Blue Mountains, Bygone Beautys Tearooms will serve you a delicious complimentary Devonshire Tea. The Bygone Beautys Cottages Blue Mountains Accommodation offers a choice of 1 Bedroom + Study Cottages and 3 Bedroom 2 Bathroom Houses, delivering that quintessential upper mountains experience, each with its own character and all located on grounds with gardens. All guest accommodation is spacious, comfortable and non smoking, beautifully appointed and offering central heating, seperate bedroom/s and electric blankets to ensure maximum guest comfort, as well as private furnished verandah which are ideal for relaxing and al fresco dining while soaking up the very special ambience. All guests receive a Devonshire Tea for the delightful Bygone Beautys tearooms in Leura. Guests staying for two or more nights also receive a FREE country breakfast platter for their first morning. Further guest facilites and services include a truly wonderful garden, tennis court, FREE off-street parking and friendly onsite staff. Bygone Beautys Cottages nestled in the stunning Blue Mountains offers delightful accommodation in a glorious setting. The Storey Grange offers 4.5 star luxury hotel and self contained accommodation situated on eight acres in the beautiful Blue Mountains National Park. Adjoining the bush, the Storey Grange B&B Blue Mountains Accommodation is one of the Blue Mountains' most hidden treasures. Nestled on the edge of the Blue Mountains National Park, Storey Grange offers the best of home-style hospitality with the comforts of contemporary living. Surrounded by manicured landscape gardens and picturesque mountain views, each visitor to Storey Grange is indulged from the moment of entry with a series of private suites, each with views of the native bushlands. There are some short bushwalks at the door, if you wish to be a little more adventurous, longer ones are not far away. Norman Lindsay Gallery is one of the most famous attractions and hours can be spent there. Swimming holes in the valley for you to swim in during the summer. Glenbrook National Park is not far away also where you can view the Kangaroos graze. The Storey Grange offers luxury, self contained accommodation. All studio apartments and 2 bedroom cottages feature a private veranda/patio with outdoor setting, air conditioning, comfortable bedding, private bathroom with Spa Bath, lounge area with dining table, wood burning open fire, digital TV, DVD player, CD player, WIFI, a fully equipped kitchen and breakfast provisions included upon arrival. For a romantic getaway you have the choice of the Studio Apartment+Extras which offers champagne + chocolates on arrival. For guest convenience, The Storey Grange B&B Blue Mountains Accommodation offers a range of guest facilities and services including BBQ facilities, health centre with massage, Spa, DVD and CD library, games room, badminton court, Free undercover parking and friendly onsite staff who are happy to assist to ensure maximum guest comfort. For luxurious quality accommodation and a fabulous location in Blue Mountains, stay at the The Storey Grange B&B Blue Mountains Accommodation. Madisons Mountain Retreat is a four-star peaceful farmstay in Kurrajong Heights, set on acres bordering the Wollemi and Blue Mountains National Parks. Secluded with stunning scenery, yet easy to reach just 3 hours drive from Canberra and 60 minutes drive from Sydney, the retreat offer 1 bedroom self-contained cedar cottages and 2 delightful refurbished train carriages. There is so much to do in the area. Madisons is close to Kurrajong Village, Bilpin, Mount Tomah Botanic Garden and Mt Wilson. Visit the Zig Zag Railway, enjoy the grass karts, explore produce on the Farm Gate Trail, visit Tizzana Winery, enjoy a cruise on the Hawkesbury Paddlewheeler, explore the Glow Worm Tunnel at Newnes, the limestone formations at Jenolan Caves, go gold panning at Sofala, golf at Kurrajong and Grose Vale, go to the races at Clarendon Race Club. There are Galleries nearby and many exquisite restaurants. All accommodation at Madison 's Mountain Retreat is comfortable and non smoking, well appointed and fully self contained, offering a cosy log fire, ceiling fans, air conditioning and heating, a separate spacious bedroom with comfortable bedding, a private bathroom with shower, toilet, hair dryer and complimentary bathroom amenities, a spacious separate lounge dining room with lounge suite, dining table and chairs, colour TV, DVD player, radio, a fully equipped kitchen with oven, microwave, full size fridge, tea/coffee making facilities, toaster, cooking utensils and crockery and iron/ironing board. The 1 Bedroom Cottages further feature a private verandah, ideal for relaxing and al fresco dining whilst watching the grazing alpaca herd. For a unique experience why not book the refurbished 1 Bedroom Train Apartment. For guest convenience, Madison 's Mountain Retreat offers a range of guest facilities and services including a large 18 metre indoor solar heated swimming pool, tennis court, BBQ facilities and entertaining area, gazebo, games room, children's play area, pet friendly accommodation, FREE off street car parking, guest laundry, cot hire, library, DVD library, gay friendly, WIFI access, friendly onsite staff who are happy to assist to ensure maximum guest comfort, large shed, common room with library, pool table and open fire, open space and acres of bush. Madisons is ideal for family holidays with the kids - have an adventure when you collect the eggs for breakfast or help us feed the alpacas every day. The retreat is also perfect for a romantic weekends offering massage, private chef, private yoga teacher and stunning bush walks. As a working Alpaca Farm, with over 75 alpacas on the property, goats, free range hens and wild ducks. There are lots of things for kids and adults to do at Madison's including bush walking, animal feeding and collecting eggs. For a unique farmstay experience, stay at Madison's Mountain Retreat.